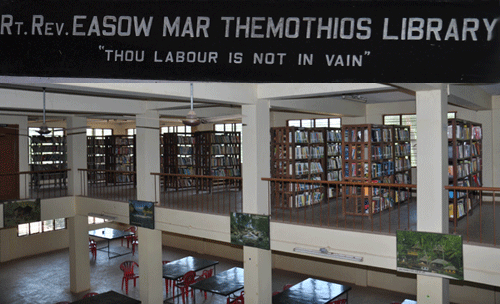 The College library is dedicated to the memory of our founder Manager, The Late Rt. Rev. Easow Mar Timotheos Episcopa who was the spirit and architect of this Institution. The library is computerised and the collections are classified and cataloged. It holds a stack of about 16105volumes. It subscribes journals, periodicals and dailies, Barcode is used for the issue and return of books. Broad band Internet facility is available free of cost for students and staff. Photostat facilities are also available in the library.